Is column footings and pier and post the same thing? Great question. Sometimes footings and foundations can refer to the same element as in the case with a thickened edge slab because such structural element can both be footings and foundations. Footing in most cases refers to a horizontal element, as shown in DET 2 below. The 4ft wide by 4ft long by 12 inches high is the dimension of this spot footing. Piers are often referred to as vertical elements often made of concrete, sometimes CMU. Piers are intended to connect the footing with the column or post. Since the footing in DET 2 was intended for an exterior footing at area subjected to freezing temperature, the footings is required by code to be below the frost line anywhere from 30 inches to 48 inches below grade. Instead of pouring a footing that is 4ft deep by 4ft square, a pier 20"x20" is used. Piers can also be footing as in the case of deck construction or covered patio where the load are not very heavy often use sonotubes for forming. 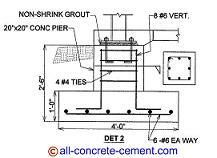 In building construction piers are mostly rectangular or square but circular piers can be used too. While footings and piers are mostly of concrete, posts another name for column can be of wood, steel, precast, or concrete. In most cases a post sits on top of footing or pier connecting the footing/pier to the rest of the structure.